Plastic and wicker food baskets come in many colors and are a great way to serve sandwiches and fries, burritos, onion rings, fried chicken, burgers, pitas, gyros, tacos, paninis and other foods. Our wholesale restaurant supply superstore carries all top brands of plastic food service baskets for your food serving requirements including carlisle, update international and tablecraft. These serving baskets are great as fast food baskets and can be lined with wax paper. G.E.T. Enterprises Round Basket With Base Black - 10.5 in. G.E.T. Enterprises Round Basket Black - 9 in. Tablecraft Rectangular Woven Baskets Black - 9 in. x 6 in. x 2.5 in. 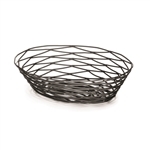 Tablecraft Metal Oval Basket Black - 9 in. x 6 in. x 2.5 in. Tablecraft Gold Vinyl Oval Basket Black - 9 in. x 6 in. x 2.5 in. Tablecraft Jumbo Oval Baskets Black- 11.7 in. x 8.7 in. x 1.7 in. Tablecraft Jumbo Oval Baskets Forest Green - 11.7 in. x 8.7 in. x 1.7 in. Tablecraft Jumbo Oval Baskets Red - 11.7 in. x 8.7 in. x 1.7 in. Tablecraft Chicago Plastic Oval Platter Baskets Forest Green - 10.5 in. x 7 in. x 1.5 in. Tablecraft Plastic Oval Baskets Black - 9.38 in. x 6 in. x 1.88 in. Tablecraft Plastic Oval Baskets Brown - 9.38 in. x 6 in. x 1.88 in. Tablecraft Plastic Oval Baskets Forest Green - 9.38 in. x 6 in. x 1.88 in. Tablecraft Plastic Oval Baskets Green - 9.38 in. x 6 in. x 1.88 in. Tablecraft Platter Oval Baskets Black - 9 in. x 6 in. x 2 in. Tablecraft Oval Plastic Basket - 9 in. x 6 in. x 2.25 in. 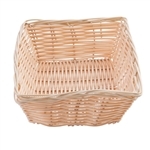 Tablecraft Rectangula Basket - 9 in. x 6 in. x 2.5 in. Tablecraft Woven Basket Black - 9 in. x 6 in. x 2.25 in. Tablecraft Rectangular Basket Forest Green - 11.75 in. x 8.5 in. Tablecraft Recipe Basket Black - 11.75 in. x 8.5 in. Tablecraft Rectangular Basket Grande Red - 11.75 in. x 8.5 in. Ovel Red Color Basket - 12.75 in. x 9.5 in. Oval Basket Black - 7.75 in. x 5.5 in. x 1.88 in. Round Red Basket Plastic - 8 in. x 2.38 in. Oval Fast Food Basket Brown - 9.5 in. x 6 in. Oval Fast Food Basket Red - 10.5 in. x 7 in. Oval Fast Food Basket Brown - 10.5 in. x 7 in. Food baskets are a staple item in quick service and fast casual dining these days for sandwiches, burgers, fries, wings, burritos and other foods. Buy wholesale plastic baskets for your fast food restaurant from the restaurant supply company that delivers quickly. The plastic ones are easy to wash and sanitize.